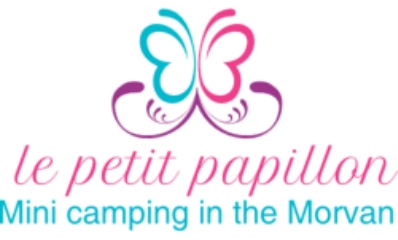 Petit papillon started off as a derelict barn and was originally purchased by a lovely Dutch couple Gerrie and Chris. They have built it up and nurtured it to how it is today. In 2016 we purchased the site, fell in love with the area and the never ending views of the Morvan. I call it the Lake District of France! We have four adult children in the UK whom we hope will visit frequently and we live here with our 2 boxer dogs and 1 cat. We have on offer three cabins as shown and a touring caravan that we also rent out on request. We have 6 letting pitches of a good size with electricity available and Wi-Fi reception free throughout. There is a small bar that serves snacks and hot and cold drinks. There is no better place for total peace and relaxation. We are open from 1st April – end of October. There is a heated toilet block, with two showers. We have a fridge/freezer for ice packs and storage. Dogs are welcome and must be kept on a lead on the site and please pick up any waste. Please note there are minimal facilities here for children. ​ * For all stays of 7 days or more in Pats cabin, Gerrie & Chris cabin and Archies cabin we provide a complimentary starter pack consisting of bread, butter, jam, milk, sugar, coffee and a bottle of wine.